One of several popular ITG products to make the transition, 2015 Leaf In The Game Stickwork Hockey is back with a limited print run. 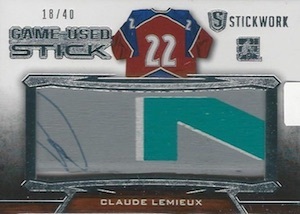 The unique memorabilia card product focuses exclusively on hockey sticks. 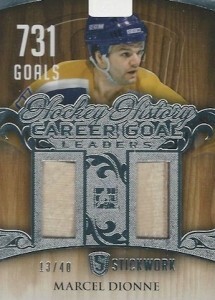 Each box includes three hockey stick relic cards. Despite featuring a specific overall scope, the set includes a variety of inserts. Game-Used Stick covers the key names of all-time, including Gordie Howe, King Clancy, Wayne Gretzky, Maurice Richard and Doug Harvey. Additionally, the men between the posts receive special recognition with Goalie Game-Used Stick. There is also a Paddle parallel. 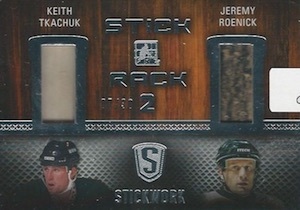 Complete Stick features a trio of relics on one card, with a piece of game-used stick, blade and tape. Hockey History All-Time Assist Leaders and Hockey History All-Time Goal Leaders honor the prolific producers in the sport. 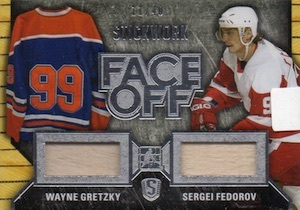 Showcasing two top scorers on the same card, Face Off offers multiple pairing options. Also containing multiple players, Stick Rack cards combine groups of two, three or four all-time greats on the same card. 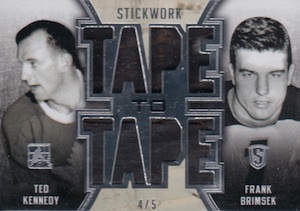 Centering on game-used stick tape, Tape Job offers another element in 2015 Leaf In The Game Stickwork Hockey. 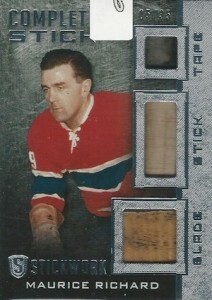 Tape-to-Tape Dual Game-Used Stick Tape goes a step further with two players per card. Lastly, Handles! 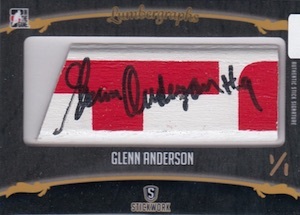 and Lumbergraphs are both one-of-one options and are among the rarest options in the product. 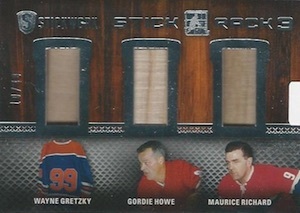 2015-16 ITG StickWork- StickRack 4 -Patrick Roy, Parent ,Tretiak ,Fuhr 1 1! Serial numbered #/10 or less. Serial numbered #/25 or less. Serial numbered #/30 or less. 46 cards. Serial numbered 1/1. 56 cards. Serial numbered 1/1. Serial numbered #/35 or less. Serial numbered #/50 or less. Serial numbered #/40 or less. Serial numbered #/20 or less. How is a product that’s got 3 cards per box at $150-200 (depending on your currency) considered only “mid-end”? Been watching breaks and this year’s product is awful. 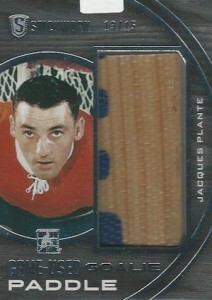 Pieces of sticks are loose in the cards and most of the stick pieces are just plain wood. Does seem the serial numbering is a bit off. There are non-parallel cards that are serial numbered to more than what is listed. I got a Lemieux Tape Job that is numbered to 40. Overall not bad. I don’t mind the wood parts so much, especially for the old players. It’s like the game used bats in baseball. They aren’t all going to have the outside “color.” The pieces not filling up the opening; however, is a bit cheap. I hope someone from Leaf read this. This product is a huge disaster. Why would you do such a bad job taking over this product. This cards are horrible quality. The stick pieces are loose in the cards! Never seen anything like this. How can you charge such a high price for a product with 3 total cards and the cards aren’t even good quality. From the breaks I’ve seen the stick pieces are way more boring and plain this year and a higher percentage of the cards have small stick pieces as opposed to a more substantial piece. Leaf clearly has no idea what they’re doing. I bought three boxes of Stickwork last year and would have bought more if it weren’t so hard to get your hands on. This year I won’t be buying any. I was a huge ITG supporter and after watching Leaf completely mishandle multiple product lines I refuse to buy anything from them. Congrats and taking a unique offering and cool offering of products and making everything worse. Your cards a joke, you don’t know your consumer at all and you’ve certainly lost a customer. I may just be one person, but I know my opinion echoes that of others. And again, only one person, but I used to spend over $1,000 a year on ITG and now I will never buy a Leaf product or support this joke of a company.